Want to know about our next Schmincke Watercolor Set? We are working with Schmincke to develop the next new custom set, expected stateside in October 2017. 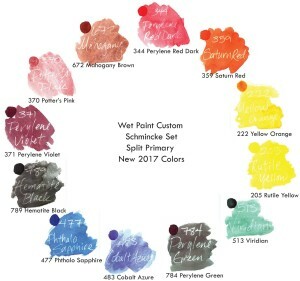 This palette of colors is a split primary set selected from the new colors that Schmincke released earlier this year. All colors are single-pigment with good or better lightfastness. Click here to pre-order the New 2017 Custom Schmincke Set!